YA science fiction and fantasy specialist, AJ Ponder, has done it again, this time with a story that is less science than her Lily Lionheart and Frankie Files titles and less interactive fiction than her Attack of the Giant Bugs adventure. Instead, Ponder has given us a narrative that is all fantasy (with a bit of alchemy thrown in). QUEST, the first book in Ponder’s Sylvalla Chronicles, is an irreverent and laugh-out-loud spoof on traditional fantasy in the vein of The Princess Bride. Quest follows the escapades of the highly non-traditional Princess Sylvalla, in her efforts to become a hero (rather than the hapless bride of some pale parody of a prince). Of course, Quest has all the accoutrements we have come to expect in high fantasy: dashing knights, wise (and not so wise) wizards, kings, monsters, dragons, castles, as well as oppressive parents, romantic ideals, and double helpings of betrayal. There is even a nod to New Zealand with the boring ‘cat’ familiar replaced by a canny tuatara. The story arc is equally epic and includes dramatic escape scenes, devious plots, and a final show-down of David and Goliath proportions. And there’s more, because Ponder is one of those authors able to write a narrative that appeals at two levels, so while Quest is perfect for precocious upper middle grade readers looking for their first fantasy experience, there is a delightfully entertaining subtext to engage adult readers, too. (Check the footnotes, especially). And don’t think because I’ve called it a spoof that Quest ignores important socio-political issues because that isn’t the case. Ponder artfully includes themes of feminism, social justice, and self-identity in Quest, all without clobbering us over the head with them. 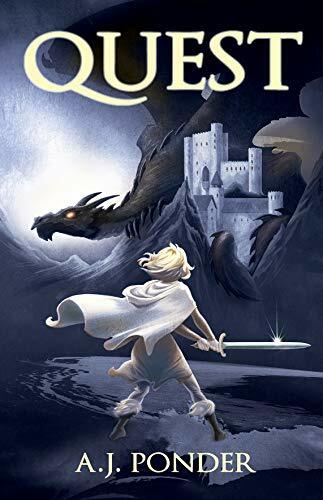 Full of great characters and wonderful plot twists, Quest is a book you’ll want to pass around all the family. Fortunately Sylvalla is not alone – Unfortunately, her new-found companions are less than heroic. Jonathan would rather make money. Dirk would rather live a long and happy life. And at 150, Old Capro would rather stop gallivanting about and harangue unsuspecting wizard students about his glory days over a nice cup of tea. Available from all the usual sources or direct from the publisher at Phantom Feather Press.